​One way of learning how to paint better is to watch someone doing what you can't do yet. It can be frustrating in some ways when you realise the huge gap between their skills and yours. But.... it can also show you ways of seeing and doing things. Ideas you haven't thought of yet, colours you might not have tried, subjects you've avoided. ( It took me about 4 years before I plucked up enough courage to paint trees!) Just seeing someone's enthusiasm might inspire you. If any of these things happen for you, I will have accomplished my purpose in doing these DVD's. Great! The feedback has been very positive for the demonstration videos I've done so far and there have been many good suggestions included in the emails I've received. I'll try to include these ideas in future efforts as I improve my skills in filming and editing - difficult I've found, especially for those of us who didn't grow up in the computer age! I hope you will find them entertaining and a real help in your painting. Working outdoors on a favourite piece of coastline but with time running short, John Crump arrived home with a disappointing result. And so, in this his latest DVD, he takes us into his studio to show us his approach when rescuing a painting from destruction. While telling us what he is thinking, he goes about the task of repainting the areas that have reduced the painting's impact and finishes with a more dynamic outcome. A useful lesson for any aspiring artist who has experienced the “pain” when a good start ends on a sour note! DVD plays in all regions. Worldwide delivery in 1-3 weeks. 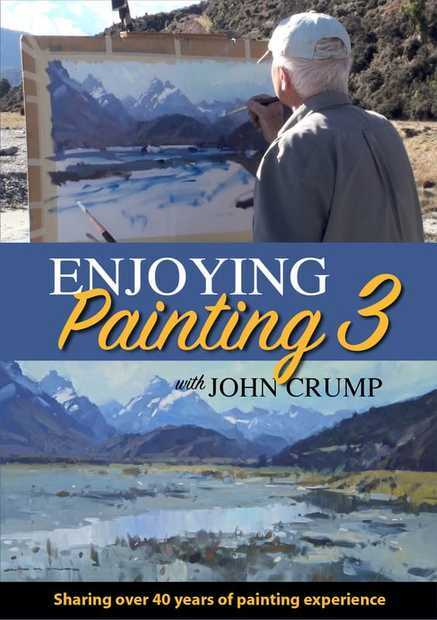 Join New Zealand painter John Crump in his studio where he demonstrates colour mixing and paint application while completing a small coastal sketch. Visit a magnificent spot in the Dart River Valley where despite the sandflies and the race against the light, John completes a large painting of one of his favourite spots. You’ll find these two lessons ideal if you want to learn valuable knowledge of using colour, composition, and particularly to learn about painting with bold expressive brushwork. 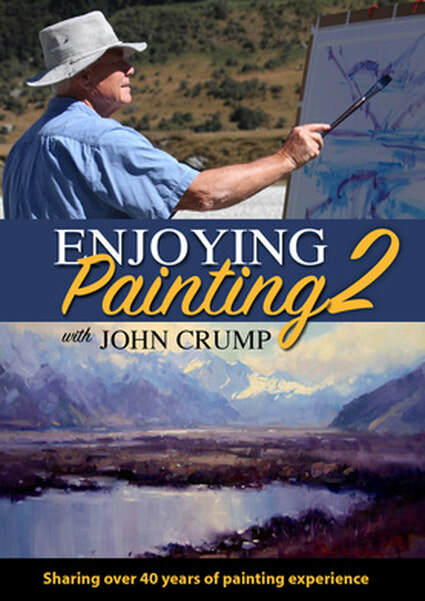 Filmed on location in a beautiful spot above the town of Glenorchy, New Zealand painter John Crump demonstrates how to set out a landscape on the canvas, how to mix colours, how your brushwork can look “painterly,” and other skills that every artist needs. In this new video, the first of a series, John Crump aims to introduce good habits and practices into your painting as well as showing you some of the trials and thrills of working in the great outdoors. He will show you his equipment, and then take you to a wintry spot deep in the South Island of New Zealand where he will complete a painting on site. In this video, John paints 2 very different subjects. The first is in a very chilly mountain valley near Glenorchy, a small lakeside village in the South Island of New Zealand. The second is painted on the wild southern coast where wind and rain unsuccessfully conspire to defeat him. In this, his first DVD, John paints a large canvas in the beautiful Rees Valley surrounded by the Forbes range under snow. Working in oils and talking to the viewers as he paints, he shares his ideas and techniques. ​Common issues such as design, colour, tones, and brushwork are covered, as he works from start to finish in one session.